Sand and stone are the most important raw materials in the construction industry. If you are looking to explore new opportunities in the industry and are willing to connect with suppliers, key decision makers and executives associated with Sand and Stone Mining, Blue Mail Media’s Sand and Stone Mining Mailing List can help you meet the objective. Our database allows marketers to connect with their target audience with the channel of their choice. We put immense efforts to keep our database reliable and updated so that you achieve the highest response rate, conversion rate and return on investments on your marketing efforts. Blue Mail Media is one of the highly reliable sources when it comes to procuring database that caters to the construction industry. We have a well established presence across multiple countries that allow us to serve clients without any regional and cultural constraints. 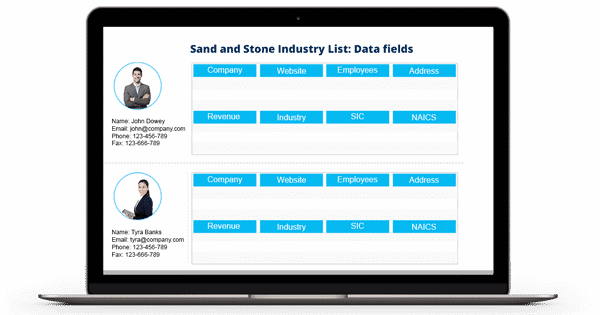 Whether you wish to communicate with your target prospects via telephone, email or mail, Blue Mail Media’s Stone and Sand Industry Email Database will help you achieve you multi-channel marketing goals with ease. Not only we offer pre-packaged Sand and Stone Industry mailing database but also we offer customized list based on specifics such as geography, job role, type of raw material, scale of operations, and size of business and so on.